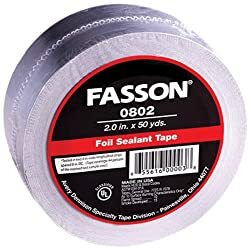 Avery Dennison Fasson 1803 and Fasson 0802 tapes are hand tearable aluminum foil tapes featuring a quick stick synthetic rubber adhesive that offers a strong bond to a variety of surfaces and forms a barrier to moisture and vapor. Designed for a wide variety of applications, these tapes are primarily used for sealing joints, seams and insulation in HVAC systems. They can also be used for various applications around the house, like repairing dryer exhaust ducts. Avery Dennison Fasson 1803 and Fasson 0802 tapes contribute to LEED points and are manufactured in the USA. Avery Dennison Fasson 1803 and Fasson 0802 tapes are UL 723 registered for meeting the stringent fire safety standard required for usage in many building and construction applications. Avery Dennison Performance Tapes has over forty years of experience developing and manufacturing high performance tapes and adhesive solutions. As a recognized industry leader, we design, engineer and deliver solutions for a wide range of applications. Please Refer to Tapes.AveryDennison.com for complete terms and conditions, including warranty terms, relating to this product. You should periodically review the site as terms and conditions are subject to change without notice.